Mainly due to modern imaging technology, schizophrenia is increasingly recognized as a developmental disease with an additional neurodegenerative component, reflected by cognitive decline and progressive loss of cortical gray matter. Even though the old term dementia praecox already implies the presence of a degenerative process, meaning loss of once acquired cognitive functions, the degenerative aspect of schizophrenia has been disregarded for decades. Dealing with a neurodegenerative disease automatically brings on the idea of employing neuroprotective/neurotrophic add-on strategies in its treatment. 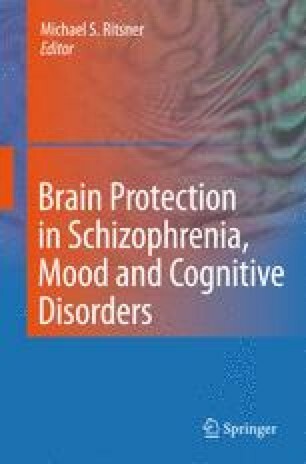 Erythropoietin (EPO) evolved as an ideal candidate compound for neuroprotection in various human brain diseases, but particularly in schizophrenia, due to its capability of combating a spectrum of pathophysiological processes operational during the progression of schizophrenic psychosis. In the nervous system, EPO acts not only anti-oxidative, anti-inflammatory, and anti-apoptotic, thereby antagonizing driving forces of neurodegeneration, but also in a neurotrophic and plasticity ameliorating fashion, thus targeting intrinsic problems of the schizophrenic phenotype. In fact, EPO improves cognitive functioning in mice and lastingly enhances hippocampal longterm potentiation among other features of neuronal plasticity, essential for learning and memory processes. EPO also prevents the development of slowly progressing global brain atrophy in a mouse model of chronic non-gliotic neurodegeneration and reduces haloperidol-induced cell death in primary hippocampal neuronal cultures. In preparation of a first trial on EPO in schizophrenia, we wondered whether EPO can penetrate an intact blood-brain-barrier. Using Indium111-labeled EPO, we demonstrated that EPO enriched within brain tissue in healthy and even more so in schizophrenic individuals, most likely explained by the higher density of EPOR expression in frontal cortex and hippocampus of the latter. Based on all these grounds, we performed a double-blind, placebo-controlled, randomized multicenter trial. Treatment over 12 weeks with weekly high-dose intravenous EPO led to significant improvement of cognitive performance in chronic schizophrenic men. Moreover, it delayed progressive cortical gray matter loss in schizophrenia-relevant brain areas as demonstrated by voxel-based morphometric magnetic resonance imaging analysis. Encouraged by these findings, an EPO treatment trial including patients with first-episode schizophrenia has been planned. This work has been supported by the Max Planck Society, by several private donations, as well as by the DFG Center for Molecular Physiology of the Brain (CMPB). The authors would like to thank Wiebke Timner for excellent editorial assistance.